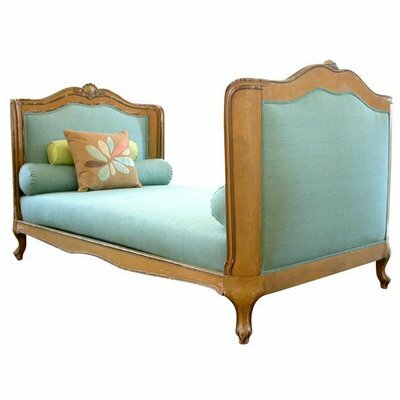 During the 1920's, Louis XV style French furniture was all the rage. This daybed, available through Downtown, is a lovely example of the Louis XV reproductions made during the Roaring 20's. 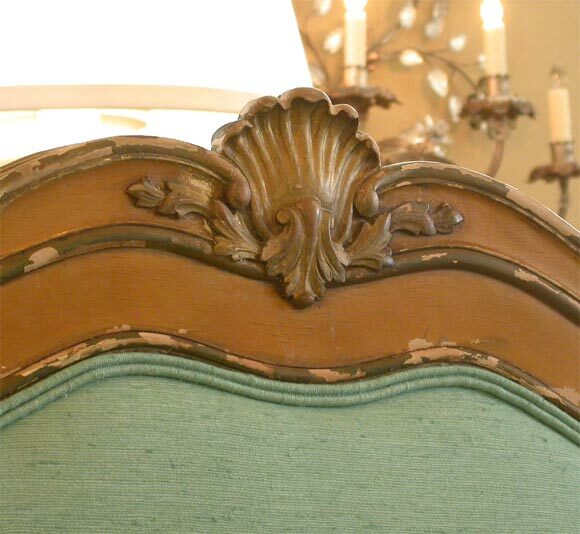 The finish here is original but the piece has been reupholstered. Personally, I love the fresh choice of the slubby aqua silk, with the simple double welt, as opposed to a heavy velvet or damask. Oh so pretty. 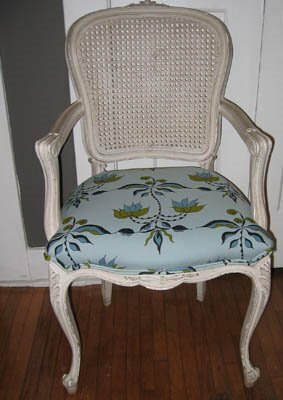 Lulu de Kwiatkowski's hand-printed cotton Moondance in light blue has long been a favorite of mine, and I love how interior designer Vanessa De Vargas used it here on this vintage Louis XV style armchair. So fresh! 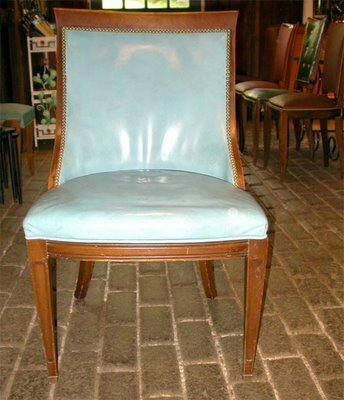 De Vargas' design firm is Turquoise and she has a great selection of custom vintage chairs. Does anyone think the upcoming film Marie Antoinette will heighten the current interest in femme 18th century style French furniture, from both the Louis XV and Louis XVI periods? Last night I saw the podcast for Vogue's Marie Antoinette photo shoot and it's exquisite. 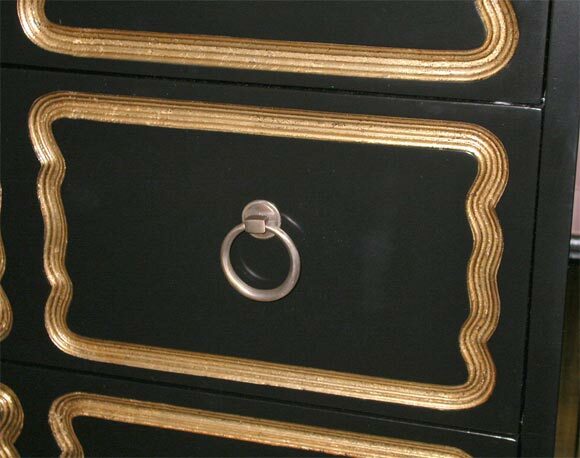 Lately I've been thinking about all the Classical references popping up in the most fashion forward interiors -- the Greek key pattern, urns, objects in pairs and the use of symmetry. Like at the Viceroy resort, shown in the top three images above. Makes me wish I could take Art of Ancient Civilizations all over again. 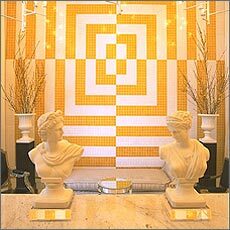 So this weekend, I plan to immerse myself in some truly ancient resort decor by visiting the exhibition In Stabiano: Exploring the Ancient Seaside Villas of the Roman Elite, at Emory University's Carlos Museum in Atlanta. Two thousand years ago, Stabiae was the premier seaside resort on the Bay of Naples, where Rome's power couples built palatial villas that epitomized imperial glamour. 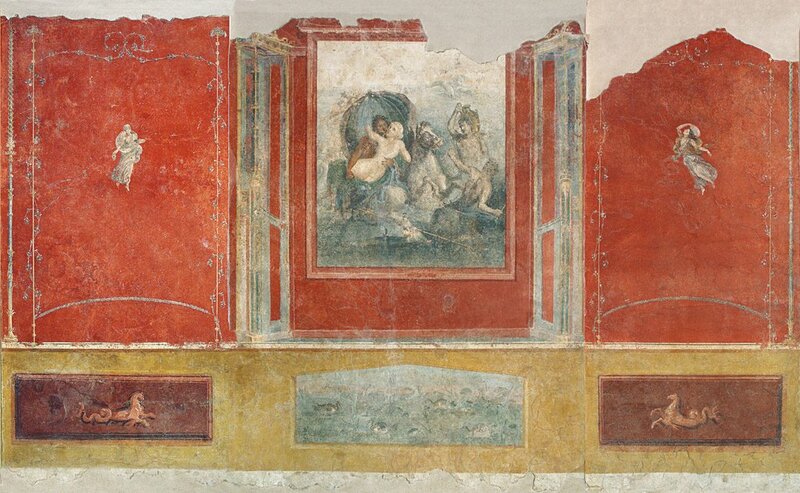 The exhibition In Stabiano recreates the atmosphere of these villas using 73 frescoes and household furnishings. 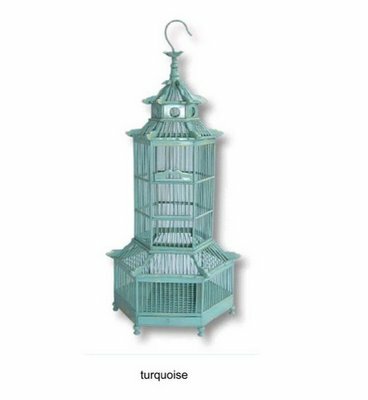 I've heard the dining room installation is absolutely gorgeous. Isn't the small Chinese style winged cabinet above luscious in aqua? It's from Red Egg, a wholesale furniture company known for reproducing timeless Chinese forms with finishes in refreshing colors, including sunflower yellow, aqua, ivory and coral. 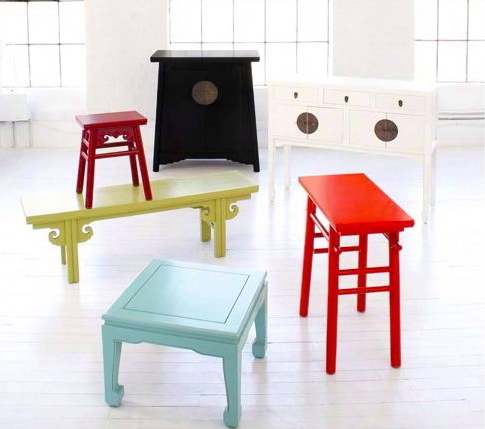 The pieces above are from Red Egg's Shanghai Loft Collection and are sold in small home furnishings boutiques across the U.S., as well as department stores such as Neiman Marcus. Although retail shopping is not available on the Red Egg site, everyone can enjoy viewing the entire collection online -- design professional or not. 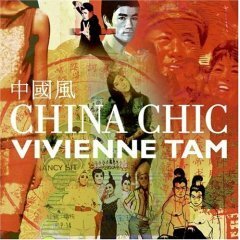 If you are drawn to Chinese style, you might enjoy fashion designer Vivienne Tam's China Chic. In the book she explores Chinese art, culture, fashion and history. 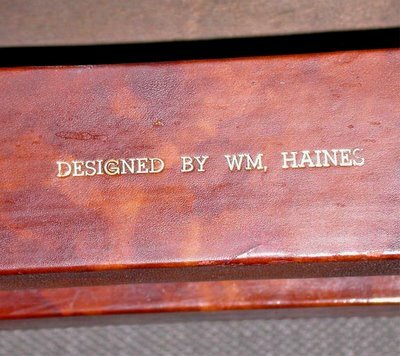 Earlier this week I shared a little information about mid-20th-century decorator Billy Haines, and the examples shown of his furniture happened to be uber-sunny and feminine. 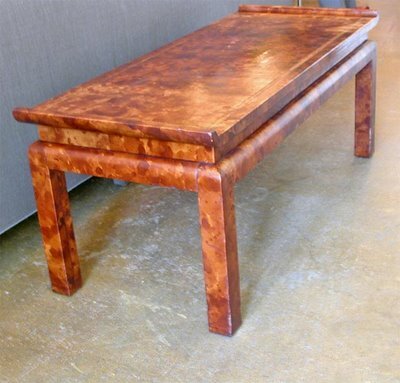 So to give a balanced view of his style, here is a gorgeous 1940s leather coffee table with tortoise finish designed by Haines that has more of a male vibe. 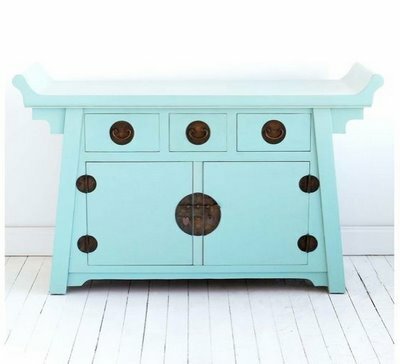 It's masculine yet gracefully proportioned. Love it! From a pair of licorice black patent leather wing chairs to Neoclassical style chairs upholstered in weathered icy blue, Ellen Ward Scarborough Antiques has a nice array of 1940s furniture with the original upholstery intact. If you are a design student interested in the Regency-inspired or French Moderne pieces produced during the 40s, this dealer's site may be helpful. 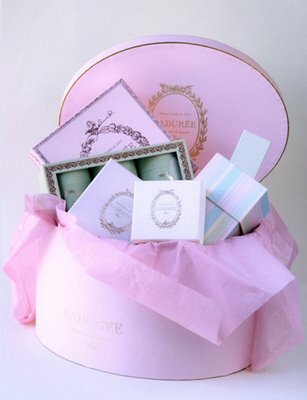 The upholstery on the chairs above reminds me of those luscious pastry boxes from the French tea-room Laduree. 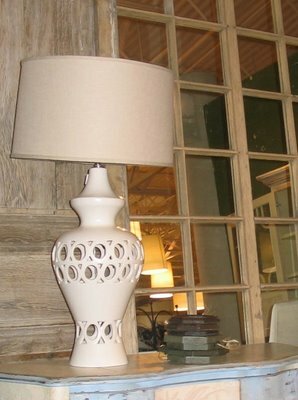 Ever since I spotted Anthropologie's white ceramic Mandeville lamp base ($398) a few weeks ago, I've been thinking it looks so familiar. 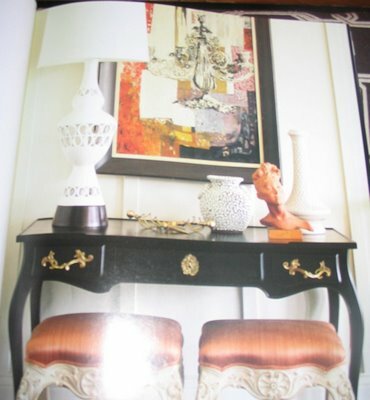 Then last night, while flipping through Modern Glamour: The Art of Unexpected Style I noticed the vignette with black desk above and made the connection. At the moment, Anthropologie has quite a few white ceramic pieces that resemble objects Kelly Wearstler has used over the years. 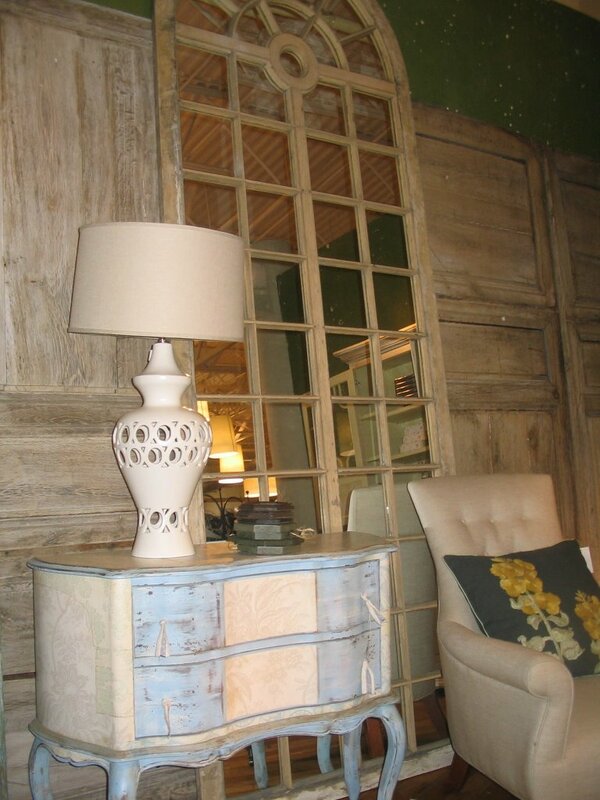 BTW, the floor to ceiling mirrored window shown below in the Atlanta Anthropologie is stunning, and there is also an enormous Dorothy Draper style exaggerated Baroque mirror in the store. 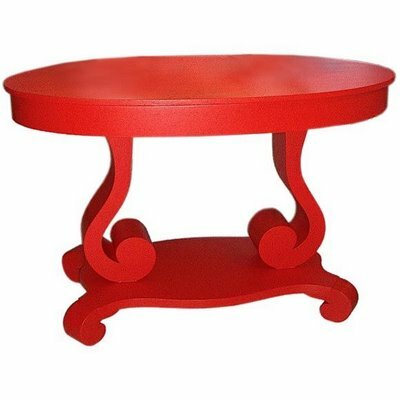 The frame has that Draper "cake frosting" quality but it is not the glossy white Draper would have specified. Rather, it has that rougher, worn Anthropologie quality. 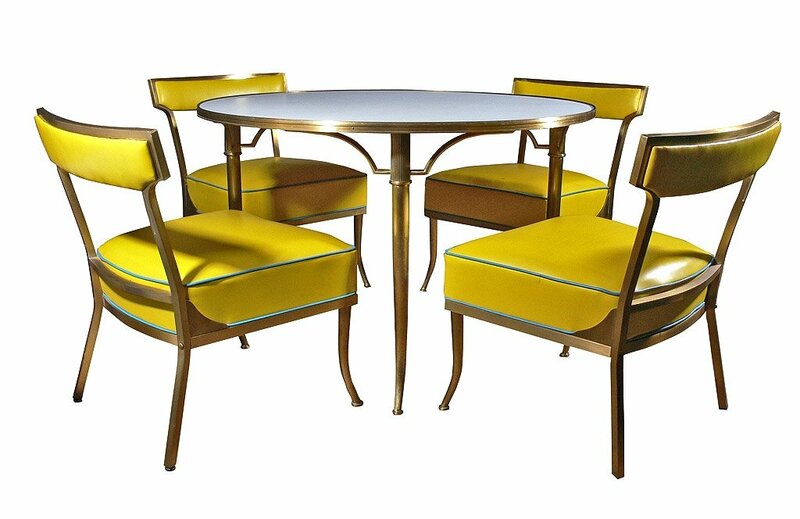 This cheerfully glamorous Billy Haines brass table and chair set recently sold through Todd Merrill Antiques, but I like to think it found a happy home in a chic, sunny breakfast room. In fact, I hope the new owners have a beautiful turquoise vase filled with fresh flowers on the table, to bring out that crisp turquoise blue piping on the original canary-yellow upholstery. If you aren't familiar with Billy Haines, he was a silent film star who became a highly successful decorator associated with Hollywood Regency style. To grasp Hollywood Regency, think Jane Austen's Emma with a posh, theatrical spin. 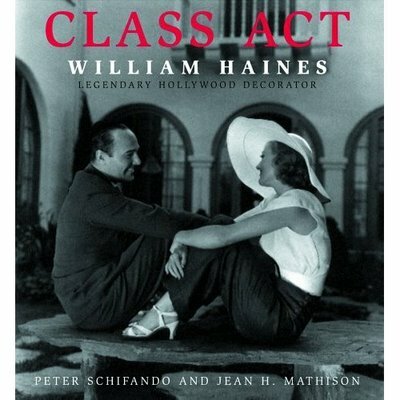 Originating in Southern California in the 1930s, Hollywood Regency was a bit of a reaction against stark Modernism. Elegant English Regency and Greek Revival forms of the early 19th century were often reinterpreted in an exaggerated, camera-ready way. 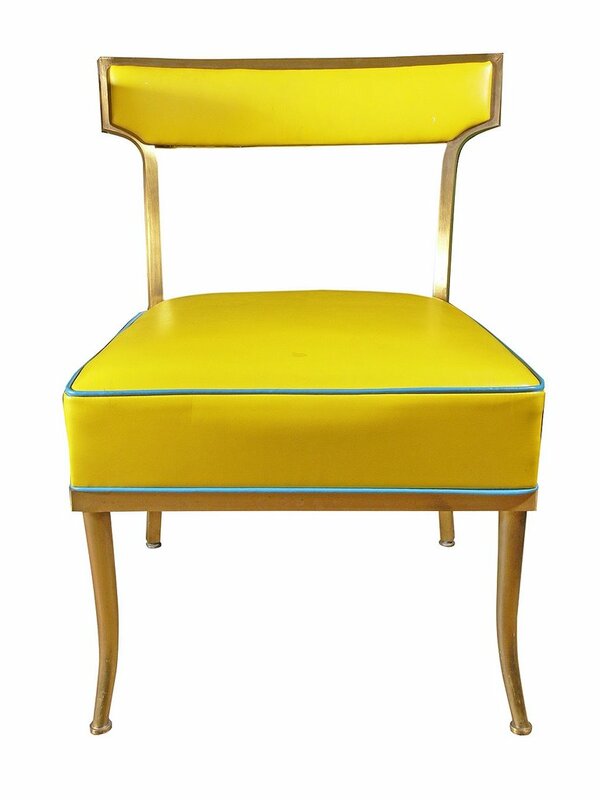 For example, the yellow chairs above resemble classic Greek klismos chairs with curved saber-like legs and broad concave backrests, but the Technicolor vinyl upholstery and white laminated tabletop are pure 20th-century. Although she died in 1969, Dorothy Draper seems to be everywhere this summer. There is her exhibition, The High Style of Dorothy Draper on view through October 9 at the Museum of the City of New York, as well as the recently published book, In the Pink: Dorothy Draper: Americas Most Fabulous Decorator. Fifteen signature Draper colors are featured in a new paint collection from Benjamin Moore, and the The Greenbrier Resort in West Virginia, famously renovated by Draper, is offering special Get Draperized weekends. Personally, I like to see one vintage Draper designed piece, such as her signature chest shown above, used in a room rather than the full-on Draper look of yore. 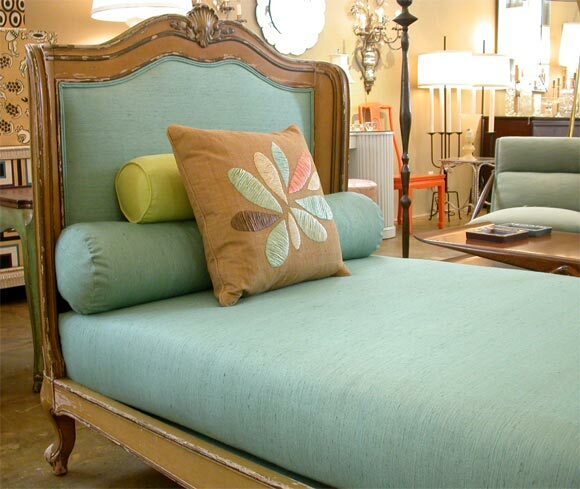 With its simple lines and glossy surface, the Draper chest can mingle among traditional or modern furnishings. Just a thought if you find a similar looking piece at a flea market. 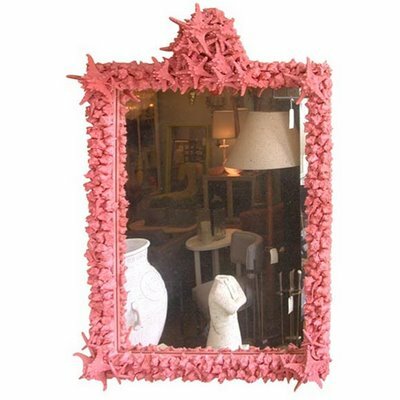 BTW: the site dorothydraper.com highlights the current work of designer Carleton Vamey and his assosiates working under the Draper name. You won't see vintage Draper there. 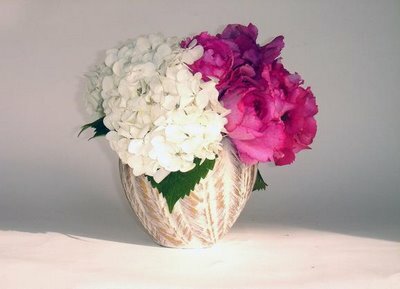 I spotted this arrangement on the Lily Lodge site and was intrigued by the description of the vase: Haeger Gold Tweed. 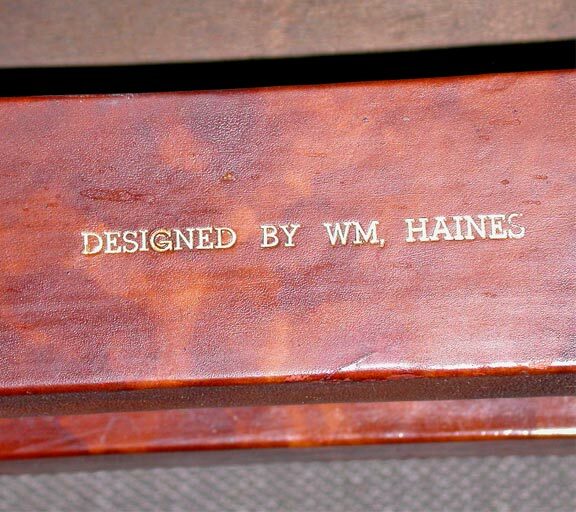 It seems Gold Tweed was the name of a glaze developed in the 1960's by Haeger Potteries. Lily Lodge owner, Ariana Lambert Smeraldo pairs her flowers with all sorts of interesting containers. 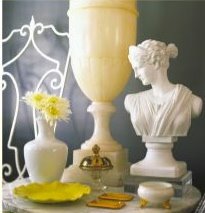 Some of the vases are rare and precious but others, I think, could be hunted down by an intrepid flea market shopper. BTW: I adore Lily Lodge's flowers in a box. 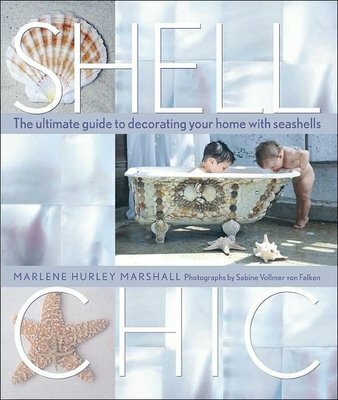 Sometimes book titles are misleading but I will say Shell Chic: The Ultimate Guide to Decorating Your Home With Seashells is extremely comprehensive. If you are contemplating making a shell piece of your own, such as the mirror above from Downtown, the book includes instructions for 35 shell work projects ranging from a child's claw foot bath tub and an opulent chandelier to simpler kids' activities. But if you are not into crafting, the book is overflowing with sumptuous pictures, resources for collectors, and shell art history. One residence featured is the glamorous shell-encrusted apartment of former Elle Decor editor (and current Domino mag contributor) Marian McEvoy. Sister Parish probably would have loved this American 19th-century library table from Laurin Copen Antiques. Sister liked freshly painted furniture, she liked cheerful reds, and she often put a glamorous spin on Americana. 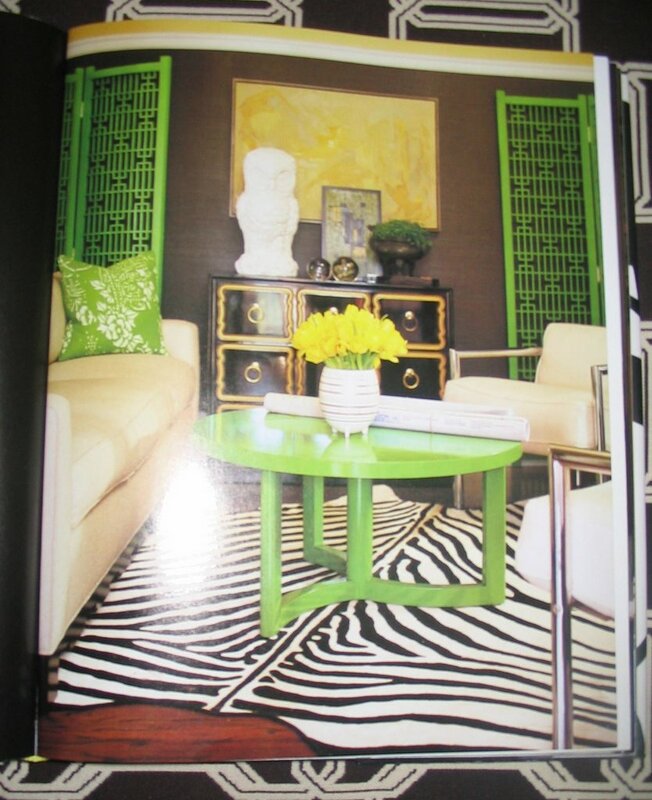 Those who worked with Sister say she had a knack for taking intense bright colors -- shades like taxicab yellow that frightened most people -- and mixing them with subdued elements so that a room worked as a whole. 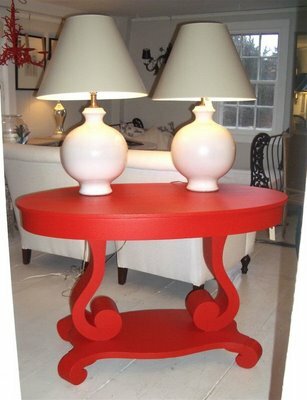 Look how the white lamps play off the red, below. So graphic. 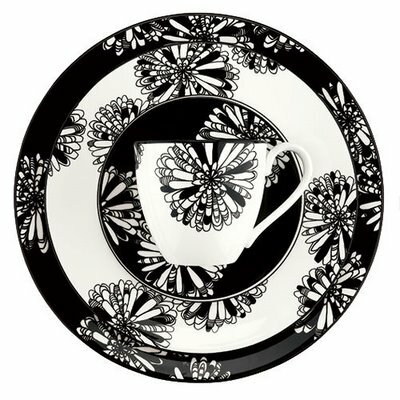 This black and white Dogwood Point china pattern from Kate Spade is not new -- I think it came out in the spring -- but I've decided it's my favorite of all the black and white, textile-like dinnerware patterns out there. 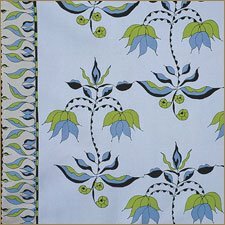 Imagine the many looks you could achieve with this pattern and various solid color table linens, punctuated with colorful fresh flowers. 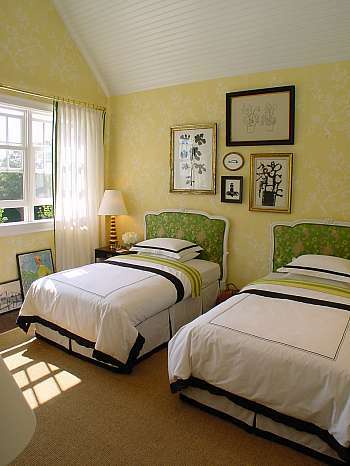 If you are drawn to a bit of black and white but prefer a softer feeling overall, the bedroom below might inspire you. 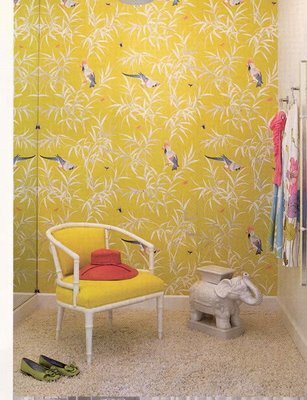 Another Kate Spade design, this time for the Hampton Designer Showhouse 2004, this summer house guest bedroom is so light and breezy. 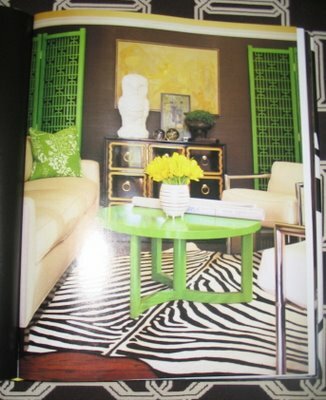 I love how the delicate yellow, white and green combination is cut with a touch of sharp black. 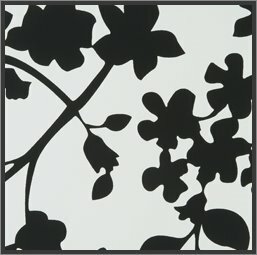 If the first time you saw the Viceroy Palm Springs you flipped for the black and white vine-covered wallpaper used at the resort, now the very graphic relief wallcovering can be yours. 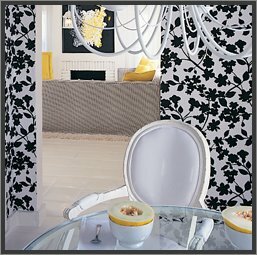 The Kor Hotel Group is selling the wallpaper to the public online. 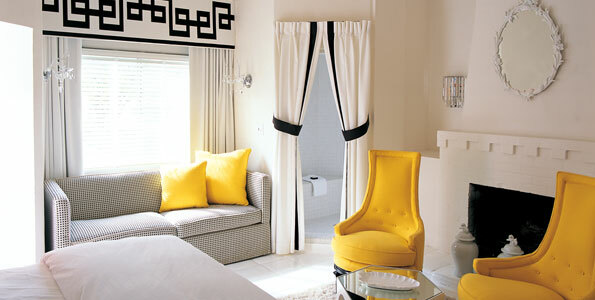 At the Viceroy, Kelly Wearstler used the black and white paper with strong yellow for a very fresh, chic look. 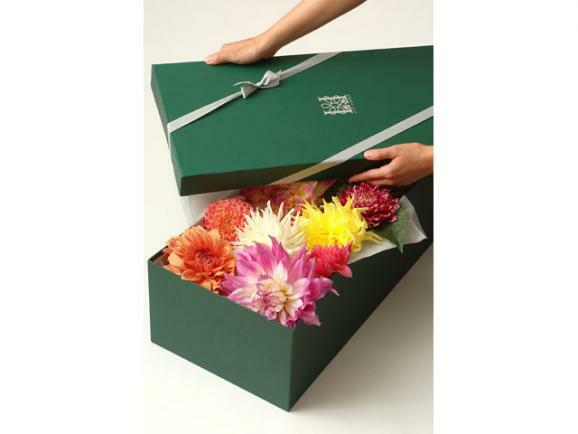 What color would you juxtapose with the paper? 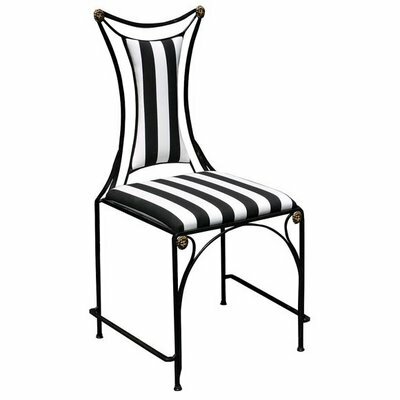 Or would you go black and white all the way? This French upholstered iron chair was designed by the venerable firm Maison Jansen in the 1940s, in the classic neo-regency style. 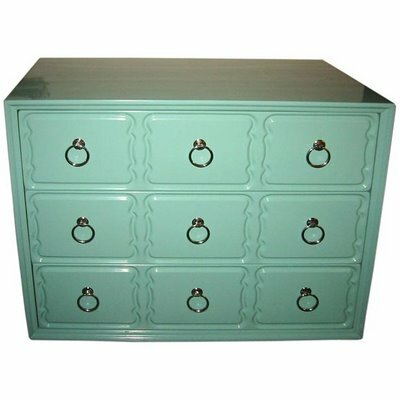 It is one of six available through Merrill Antiques. Wouldn't the set look amazing in a sunny breakfast room or in some sort of poolside, cabana-like dining area? I thought these Jansen chairs might be inspiring to someone who finds a few fab vintage iron chairs in need of recovering at a weekend flea market. 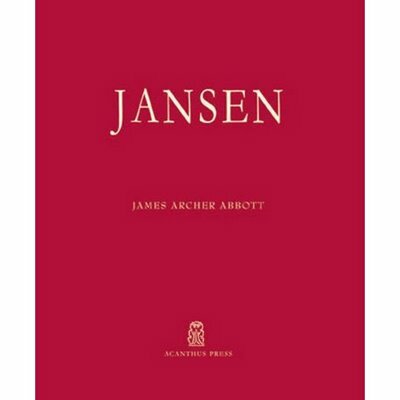 Also the recent release of James Archer Abbott's book, Jansen (20th Century Decorators) has renewed interest in the firm. Many view Maison Jansen as the most famous and influential interior decorating house of the 20th century. The book is expensive and features very grand interiors, so it won't be of interest to everyone, but I think it is a must for the library of a serious interior design student. If you live in the Washington D.C. area, the Corcoran is hosting a lecture and book signing with Abbott on Thursday, Sept. 7, at 7 p.m. Tickets cost $16. 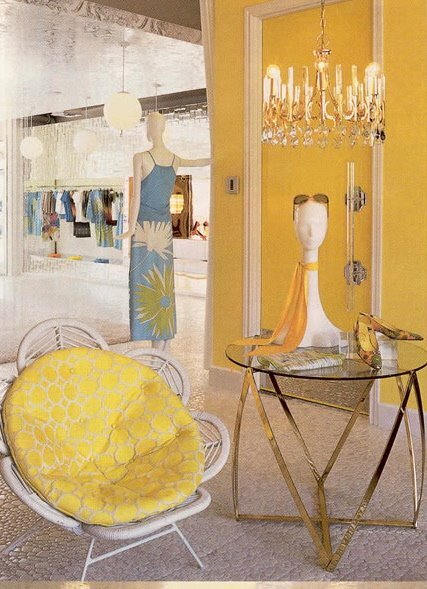 In addition to being fashion savvy, designer Trina Turk is known for having a great eye for interior design and architecture. Designed by KWID, Turk's boutiques in both Palm Springs and Los Angeles are visually interesting and nothing like the expected minimal white store. So, it's no surprise that her fashion ads always seem to be photographed in intriguing spaces. I'm certain I recognized one of Tony Duquette's former residences in the background one season. 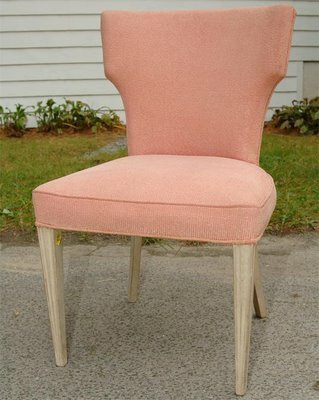 Even the ads shot on the beach usually have a striking chair included. The dress below is from Turk's holiday '06 collection. Does anyone recognize the location?